For the 15th consecutive year, we will be awarding 16 college scholarships for the upcoming academic year to high-school seniors funded through the OneBeacon Charitable Trust. Eight of these $2,000 awards will be available to the children of the brokers, agencies and wholesalers doing business with OneBeacon. The remaining eight awards will be available to children of OneBeacon employees. Applying is easy—simply complete the online application by April 16. If you have any questions, please contact our scholarship program administrator, Scholarship Management Services at 507.931.1682. Scholarship recipients will be announced in early June, and the awards will apply toward the 2018-2019 academic year. Best of luck to the Class of 2018! We wish you all the best during the holiday season. And during this time of giving, we invite you help us allocate our annual holiday donation among three very worthy nonprofits. This gift is funded through the OneBeacon Charitable Trust. Just view our holiday card to access our giving poll. 2016 College Scholarship Applications Available! We’re excited to announce that we are once again awarding 16 college scholarships for the upcoming academic year funded through OneBeacon’s Charitable Trust. Graduating high-school seniors who are children of our employees or producers are eligible to receive these $2,000 awards. Applying is easy – simply download the application and review the program brochure! Recipients will be announced in early June, and these one-time awards will apply toward the upcoming 2016-2017 academic year. Please direct all questions to the program administer, Scholarship Management Services, at 507.931.1682. Over the holidays, the OneBeacon Charitable Trust also contributed donations totaling $50,000 to nonprofits across the country, specifically in local communities where OneBeacon has a presence. Below is a list of the 25 nonprofits we were pleased to support, with the sponsoring office noted in parentheses. Local employees from these offices helped identify worthy organizations where they may volunteer or offer support, or that is simply recognized for helping a meaningful cause. Happy holidays from all of us at OneBeacon! In the spirit of the season, we are once again giving back to those in need. Vote here (or click the image below) to help us allocate the OneBeacon Charitable Trust’s donation among three worthy nonprofits. We’re excited to announce that the 2015 college scholarship application and program brochure are now available! Once again, 16 college scholarships funded by the OneBeacon Charitable Trust will be granted for the upcoming academic year. Deserving members of the Class of 2015 are eligible to receive a $2,000, one-time scholarship. Recipients will be announced in early June, with eight scholarships awarded to OneBeacon employees’ children and another eight granted to our producers’ children. Applications along with a complete transcript must be submitted by April 15. Please send all required materials to the following address, and refer questions to Scholarship Management services at 507.931.1682. Good luck to our 2015 applicants! OneBeacon was pleased to donate over $80,000 during the recent holiday season, supporting organizations that matter most to our community. 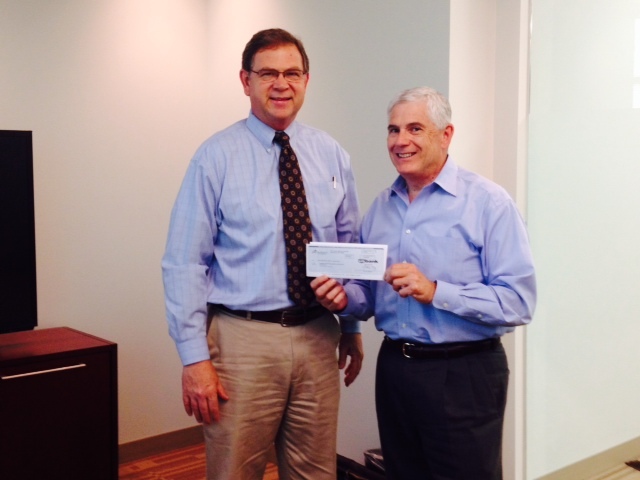 At OneBeacon, we’re pleased to contribute to the insurance industry’s community giving . Our efforts were recently profiled in the Insurance Information Institute’s Impact magazine, which highlights the variety of ways in which our industry gives back. You can read about more about these initiatives on page 21 of Impact’s summer issue, along with a broad spectrum of the insurance industry’s charitable activities. To help ensure the ongoing success of our industry, we appreciate opportunities to educate and mentor the next generation of insurance specialists. One recent example came through OneBeacon Technology Insurance (OBTI), which committed to a five-year sponsorship of a scholarship targeting students enrolled in the Georgia State Risk Management & Insurance program. The annual contribution is funded by the OneBeacon Charitable Trust. Recently, OBTI President John Wurzler presented the first sponsorship check to David Buechner, Director, Georgia State University Risk Management Foundation. And to reinforce our commitment, John will additionally assume a position on the Foundation’s board. OBTI President John Wurzler (right) presents sponsorship check to Georgia State’s David Buechner.